Be it a romantic date or a party with friends, a yacht excursion is always a hit. We have companies like Chennai-based Leisure Yacht Company that takes a limited number of people for a three-hour trip. In fact, their specialty is sunset-watching from the yacht. 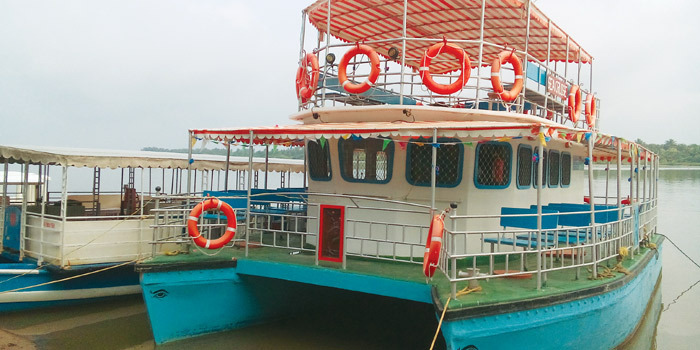 Now Pondicherry has its own backwater river cruise entertainment, which includes a joy ride, music and dinner. Starting from tomorrow, the service can be availed till December 28. Pondicherry Tourism and event management company, Varsham Entertainment, are organising the service. a�?We dona��t have anything similar in Pondicherry. Ia��m hoping this will do well, considering it is festival season,a�? says R Ramkumar, an event manager with Varsham Entertainment. The yacht can accommodate up to 40 people. While the first floor is dedicated to entertainment, the deck is dedicated to dining. a�?We are bringing in comedians from the reality show Kalaka Povathu Yaru. We will also have stand-up comedian Anand to make the guests laugh. There will be games for children and a dance floor, too,a�? adds the Pondicherry native. For dinner, they have a buffet. a�?For vegetarians, there will be chapatis, vegetable biryani, vegetable curry, curd and dessert. For non-vegetarians, we will have chicken starters, chapatis, chicken biryani and dessert,a�? he informs. Safety is of utmost importance to Ramkumar and his team. a�?We will distribute life jackets to everyone and hand them safety instructions. Nobody is allowed to bring food or alcohol on to the boat. There will be two lifeguards on board, too,a�? he says.